332 pages | 44 B/W Illus. 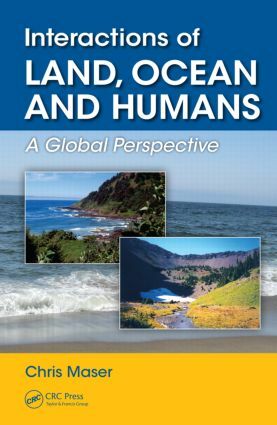 Written by Chris Maser, one of the architects of the sustainability movement, Interactions of Land, Ocean and Humans: A Global Perspective explores a critical number of the myriad aspects that comprise the great, reciprocal feedback loops between the mountain peaks, the deep sea, and everywhere in between. Maser’s exploration of these connections gives us the tools required to open our imaginations and our scientific literacy, offering insights into the relationships between the land, sea, and people that could influence us toward better decisions. The author examines the hydrological cycle, hydrological continuum, and anthropogenic pollution of various kinds from the atmosphere to deep belowground. He also highlights connections by detailing how human behavior changes the atmosphere, which changes the oceans, which alters the climate, which alters the atmosphere and thus the ocean, and so on. The book then explores the biophysical commonalities between landscapes and seascapes, as well as the habitats, in each realm. It covers marine fisheries; marine protected areas; oceans as a commodity, as part of the global commons, as a biophysical living trust for which we are the trustees and the children of today and beyond are the beneficiaries; and more. Can we arrest this deleterious process? Yes, but it will take a dramatic shift in human behavior worldwide. Why? Because, just as the collective human behavior and lack of awareness caused the problems in the first place, the level of consciousness that caused the problem is not the level of consciousness that can fix it. We must shift our thinking from that which is symptomatic to that which is systemic if we are to have a sustainably productive environment through time. Maser gives us the understanding of the biophysical interactions among the lands, oceans, and peoples of the world needed to create sustainable solutions to environmental problems. "It’s been a very rewarding experience reviewing Chris’s book, far more fun and educational than I ever anticipated. Through his work as a scientist and his personal experience, Chris takes the reader on a journey around the world to explain, understand and appreciate the scientific, economic and emotional linkages between the land, oceans and people. He reminds us that our actions today are the choices that will determine the environmental legacy we leave for future generations. Also, that if the human species is to exist we must do no harm to the very commons that support us at all levels of life. And, in conclusion, how we educate our youth will provide the foundation of hope needed to show the world that we must change our way of thinking if we are to save us from ourselves." "The oft quoted axiom that everything is related to everything else is widely saluted as a theoretically construct, but it is rarely seriously explored, perhaps because of the complexities of real life. This book is different. In "Interactions of Land, Oceans, and Humans," Chris Maser systematically describes often remarkably counterintuitive biophysical relationships and interactions. However difficult to understand and appreciate, everything, including humans and nonhumans, is an interactive, interdependent part of a system whole. And, forget about some idealized, reassuring notion of the balance of nature. Maser totally debunks such thinking with a hardy dose of cutting edge science and common sense." "All life is connected, a universal concept that in Maser’s lyrical prose pulsates with the constant interchanges between land and sea. Interactions of Land, Oceans and Humans: A Global Perspective describes a planet of marvelous and intricate design too precious to defile. Yet defile it we have, as Maser recounts in unflinching detail. Despite his disheartening review of how badly humans have behaved since the advent of agriculture, Maser manages to leave us with optimism. The way forward, he says, is to reconnect what we have broken—to reestablish the global common. He challenges us to mend our thinking with cooperative humility. Acting now will leave a sustainable world as our legacy to all generations. Who can resist that hope?" Once in the World’s Oceans, Do All Pesticide Residues Stay There? Principle 6: We Must Consciously Limit Our "Wants"
WEALTH VERSUS MONEY—WHAT’S THE DIFFERENCE? WHAT DOES IT MEAN TO "NURTURE" CHILDREN?